Fast Delivery! Some items might be available to ship today! In-House Tooling (most items)! Small runs are one of our specialties! Samples Readily Available! 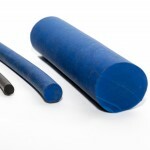 Viton Cord, Tubing, Square, Strip, and Profile Shapes have been the specialty of Rainbow Rubber Extrusions for over 30 years. Click each header for more information about our Viton products and services. 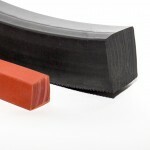 Let Rainbow Rubber Extrusions be your Viton® Square supplier! 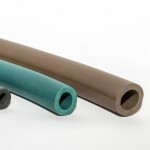 Let Rainbow Rubber Extrusions be your Viton® Strip supplier! 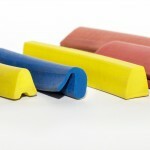 Let Rainbow Rubber be your Viton® Profile Shapes supplier! Viton® is the most specified Fluoroelastomer rubber for fuel system seals, hoses, o-rings, and gaskets as well as many other uses. Viton® has excellent temperature resistance (up to 400°F) and offers a wide range of fluid and chemical resistance to oils, lubricants, and fuels. Specified for fuel systems seals and hoses, O-rings, and gaskets, Viton® fluoroelastomers can outperform the competition. Beware of Viton “blends”. Unfortunately there are many low cost “blends” on the market, sometimes referred to as an “industrial grade” of fluoroelastomer at a reduced price. 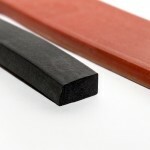 Blending Viton with any hydrocarbon rubber will seriously degrade the resistance to heat, fluids and compression set. This can put your operations at risk of failure. 196 S. Van Buren Ave.